Intensive classes, dramatic games, and new friends! Looking for an exciting way to start off your holidays? Join us for fun at The Magik Theatre Mini-camps. Students will take intensive classes, play dramatic games, make new friends, and see a Magik Theatre performance. Magikal Adventures (Ages 5-8) | Hone your acting and movement skills while having a fantastic time at this Play in a Day workshop. Designed for both beginning and intermediate actors, this class will build our students’ knowledge of character development and voice and allow them to explore physical movement and shape, all while having an amazing time and meeting new friends. Students will take themes from their favorite books to develop into small scenelets for performance at the end of each session! Class size is limited, so sign up early! Musical Theatre Marathon: Into the Woods Jr. (Ages 7+) | Gear up for our Spring Academy production of Into the Woods Jr. with this Play in a Day workshop! Your triple threat will learn the audition process and the choreo and music to a few songs from this beloved musical. Class size is limited – it will fill up fast, so enroll today before the clock strikes midnight! We know that new registration processes can be a challenge, so we are happy to provide step-by-step instructions. Parents, please download these registration instructions to aid you in registering your child for camp. We’re excited to offer a new “Play in a Day” format for our Mini Camps. 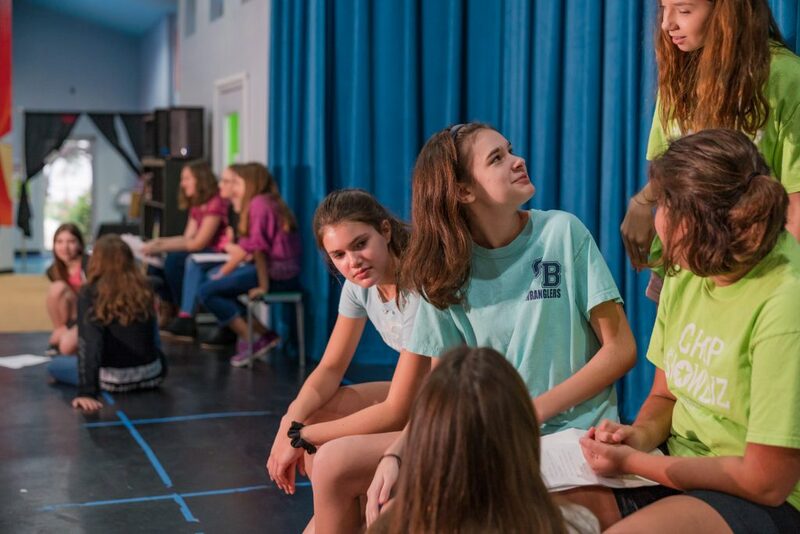 Each day of camp will have a stand alone product that will give students a well-rounded understanding of developing theatre regardless of how many days they attend. The camp day begins at 9 AM with vocal and physical warm ups. The campers then move into classroom time until 11:30 AM. From 11:30 AM to 12:30 PM our campers eat lunch, socialize, and play outside (weather permitting). The afternoon is spent in classroom time working on their curriculum goal (a written play, musical theatre performance, or creative drama). At the end of the day each class will record their final product for the session and have snack as they discuss their accomplishments. Dismissal for mini camps is at 4 PM. During classroom time the instructors use a variety of lessons, games and creative projects to accomplish the goals of the class. Oftentimes these activities are so fun our campers don’t even realize they are learning! All students must wear closed-toed lace up shoes and comfortable clothing to camp. Please do not send electronic devices or other valuables with your students, to ensure nothing gets lost or broken. The Magik Theatre will provide an afternoon snack, and a drink for each camper. If your child has allergies, or you would prefer to provide your own snack please let us know. Lunch is not provided. Please pay in full upon registration. Tuition (minus a $25 administrative fee per child) is refundable up until 5 days prior to the first day of mini-camp. Extended Care is 8:00 a.m.-9:00 a.m and 4:00 p.m.-5:30 p.m. We offer an hourly rate as well as a flat rate per child per day. If you have an unforeseen circumstance and will be running late in the afternoon, please call ahead and we will place your child in Extended Care until you arrive. Hourly care is $10 per hour per child and must be paid in cash or check upon pick-up or drop-off.